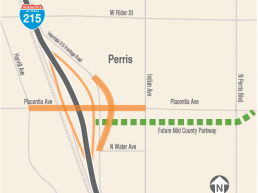 Motorists will have a new entrance and exit to and from Interstate 215 in Perris, with construction of the Placentia Avenue interchange starting next year. In August, the Riverside County Transportation Commission will be seeking construction management services, including materials testing and land surveying, for this new interchange. Construction activity is expected to begin in late 2019. The project represents “Construction Package #1” for the Mid County Parkway (MCP) Project. RCTC reached a final settlement earlier this month with a group of plaintiffs to resolve legal challenges to both the MCP and the State Route 60 Truck Lanes Project. 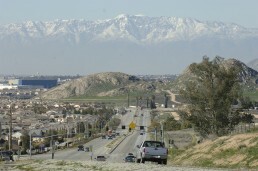 The MCP will provide a new 16-mile east-west transportation corridor between Perris and San Jacinto. For more information about the MCP and Placentia Avenue interchange, please click here.